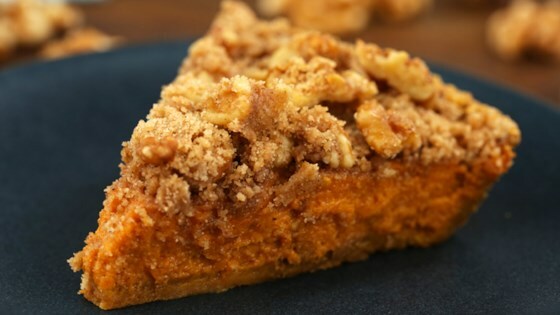 "A walnut topping adds lovely crunch to this quick and easy spiced pumpkin pie with a hint of maple flavoring. Store leftovers covered in the refrigerator." Preheat the oven to 425 degrees F (220 degrees C). Combine pumpkin, condensed milk, eggs, maple extract, cinnamon, salt, ginger, and nutmeg in a large bowl. Mix well and pour into the graham cracker crust. Smooth the top with a spatula. Bake in the preheated oven for 15 minutes. Reduce oven temperature to 350 degrees F (175 degrees C). Continue baking until filling is set, about 30 minutes. Prepare walnut topping while pie is baking. Mix brown sugar, flour, and cinnamon together in a bowl. Cut in butter with a fork until coarse crumbs form. Stir in walnuts. Remove pie from the oven and cover evenly with the topping. Continue baking until topping is golden brown, about 10 minutes. Cool completely before slicing. Substitute an unbaked pie shell for the graham cracker crust if preferred. The walnut crumble on top is such a great additional crunch and flavor! I made a gluten free crust with gluten free shortbread cookies and omitted the flour in the topping. Turned out great! Delicious pie recipe! The walnut topping could be made on it's own and eaten as a snack or put on top of oatmeal, cereal or even yogurt. Turned out pretty good. Added 1/8 tsp of grounded cloves as well.